Explanation: To some, it looks like the wheel of a cart. 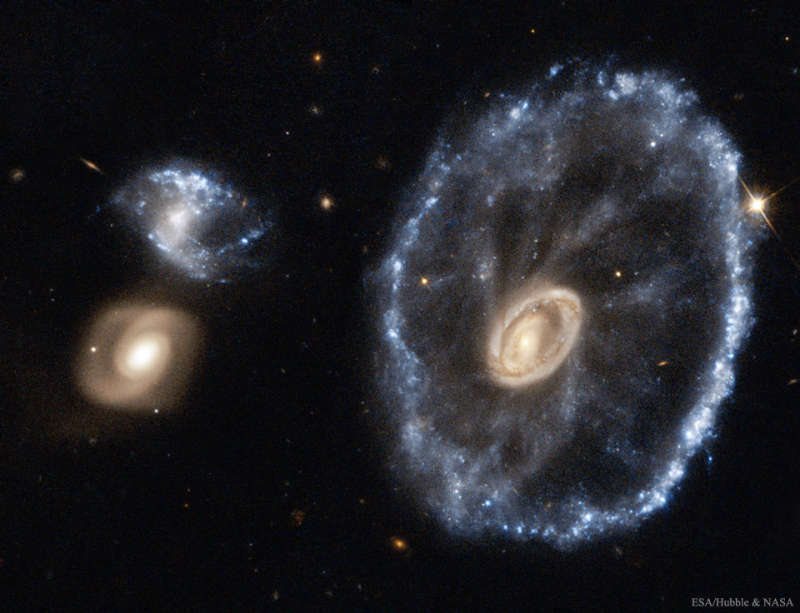 In fact, because of its outward oval appearance, the presence of a central galaxy, and their connection with what looks like the spokes of a wheel, the galaxy on the right is known as the Cartwheel Galaxy. To others, however, it looks like a complicated interaction between galaxies awaiting explanation. Along with the two galaxies on the left, the Cartwheel is part of a group of galaxies about 400 million light years away in the constellation Sculptor. The large galaxy's rim spans over 100,000 light years and is composed of star forming regions filled with extremely bright and massive stars. Pictured, the Cartwheel's ring-like shape is the result of gravitational disruption caused by a smaller galaxy passing through a large one, compressing the interstellar gas and dust and causing a star formation wave to move out like a ripple across the surface of a pond.